Offline, Digital Design & Marketing. Branding, Magento Web Development & Design, SEO and PPC. When a client approaches you with an online catalogue of over 30,000+ products that need to be sold online, you have to get your data head on! Brave specialise in being able to see client’s data problems as challenges which need solving. As a development agency, we don’t just do web development, we do data too. 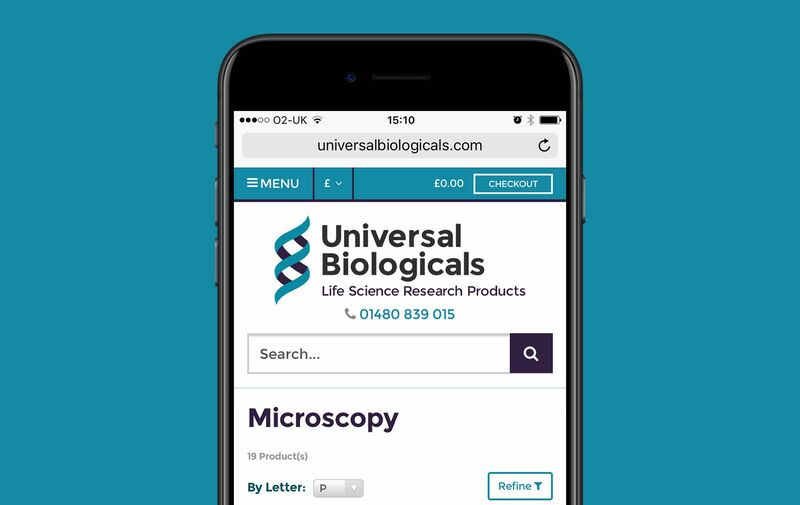 Cambridge based company Universal Biologicals, focus on the marketing and distribution of assays, antibodies and high performing lab ware for Life Science Research within the European Market. With over 20 years’ vast experience in the sector, they were looking for a slick online e-commerce tool to expand their operation, improve their online visibility and ramp up digital transactions. Initially, we were charged with the creation of a new brand identity, followed by the web development of an e-commerce store, sat on a Magento foundation. The existing site was clunky and nothing more than an unoptimised product catalogue. We needed to find a way of elegantly presenting all of the 30,000+ products, whilst considering operational aspects such as data imports. Search visibility, user experience leading to conversion optimisation were all key factors that needed to be addressed. Due to the way in which the Content Management System running the site handled product page creation, the size of the website had grown exponentially. From roughly 30,000 products, Magento’s CMS managed to create over 700,000 web pages. This lead to a huge amount of duplication, as well as a massive drain on server resources when anything tried to crawl and index the website. On top of that, due to the sheer volume of pages, Google had not managed to index any more than 2,000 pages before giving up. Thus, it was imperative that this issue was resolved as soon as possible. The huge amount of duplication added to the inability to index the website as a whole meant that the client was not ranking and had no visibility in search results whatsoever. Technical SEO to the rescue. Through our analysis, we found that the CMS was creating new versions of product pages with different URLs each time a product was updated. On top of this, due to the way product data was given to the client by the manufacturer, it was unable to be uploaded with configurable product data. Instead, products that were actually the same, but in different volumes, such as different weights of powder, would be treated as individual products. Due to duplications of product names, page titles and various other metadata, as well as product descriptions, we rectified this with the creation a completely bespoke piece of importer software – sorting the data and uploading it correctly. This allowed for the creation of configurable products, meaning that product variations became choices within a single product page, rather than multiple pages. Next, we addressed the creation of new URLs when a product was updated, changing the page creation system within the CMS so that when the updates are carried out, new pages are not created. Now that the data was presented to Google in a way that was crawlable and therefore completely indexed, we looked to Conversion Rate Optimisation (CRO) techniques; studying user behaviour with Google Analytics and heat mapping tools. This allowed us to design the pages in such a way that nurtured visitors through their buying experience in this hugely complicated data heavy site. 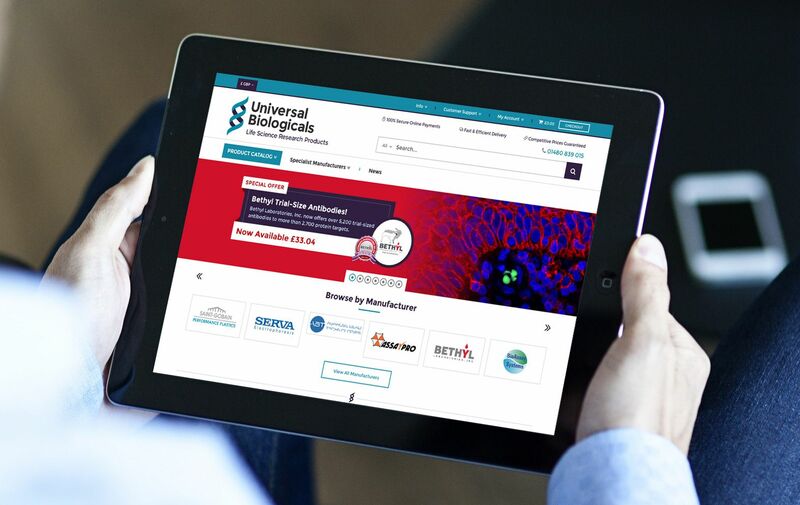 Universal Biologicals have a site which is massively streamlined since our involvement. There are less pages and the client is constantly improving their search visibility with our continued SEO and technical consultation. We have taken a core Magento Development installation and thought around the problems that were holding it back, to create a relatively efficient online, user-friendly experience. In addition, the changes have allowed us to create higher quality scores within Google AdWords. Our management of these campaigns has resulted in lowering click costs and increasing clickthroughs and more revenue. 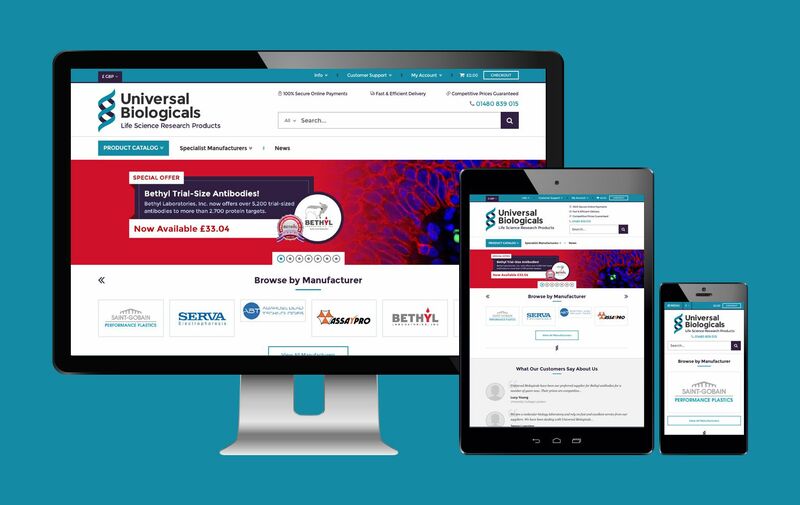 With an almost instant increase of 95% in traffic for the website as a whole, despite a low-level spend and single manufacturer promotion – we have a very happy client who can now thrive as a major players as a Cambridge located specialist in Life Science Research lab ware.